By 1965 the new San Ramon Fire Protection District was small but on its feet. Bill Fereira became the full time Chief with one full-time fireman, Francis “Sunny” O’Shea. Fire suppression apparatus included a 750 GPM Van Pelt pumper, a 1200 gallon capacity tanker (built by Fereira and the volunteers) and a pick-up truck with extra equipment. San Ramon’s first water mains and hydrants were installed that year. Seventy five responses were made, most of which were fire calls. Fereira leased, then sold, the fire house property to the district for $30,000, in the center of old San Ramon. He said that two years later the lot was worth twice the price. Fire prevention and suppression were their business and Fereira set up volunteer training twice a week which included drills, laying hose, etc. In 1963 he organized a practice fire and burned down the old San Ramon General Store. It happened this way: the older Fereiras moved into a new house and the store was left vacant. Since the store was structurally unsound and the costs to bring it up to county code were prohibitive, it was burned to give the volunteers some actual experience. Nowadays the store might have been preserved, but in the sixties the preservation movement was just beginning. The San Ramon and Danville Fire Departments assisted one another when needed, as did the new volunteer Tassajara Fire District after 1969. When the Danville Variety Store burned in 1968, San Ramon firefighters helped out. Lightning struck Mount Diablo’s Eagle Peak area on August 1, 1977, and all valley and state firefighters fought the raging fire for five days. It topped the crest on the south side of the summit and eventually consumed 6,300 acres. 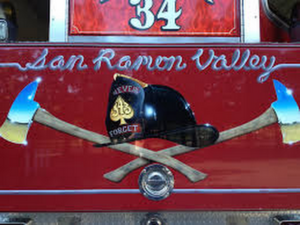 During the fiscal year 1975-1976 the San Ramon department had 110 fire calls and 147 medical emergency calls. There were 14 shift personnel (many with EMT training) and a station equipped with pumpers, a rescue vehicle, a six-wheel-drive vehicle and other equipment. The San Ramon trucks were bright yellow because a study in the sixties said that this color was the most visible under all conditions. More and more emergency medical calls were coming to the District. About 1974 Chief Fereira said “we bought a rescue vehicle because we were so remote from ambulance service. Some calls were taking too long.” The firemen used the vehicle if the patient wasn’t stable and contracted with an ambulance service out of Fremont for other transports. The nearest hospitals were Kaiser (9 miles away) and Muir (11 miles away). 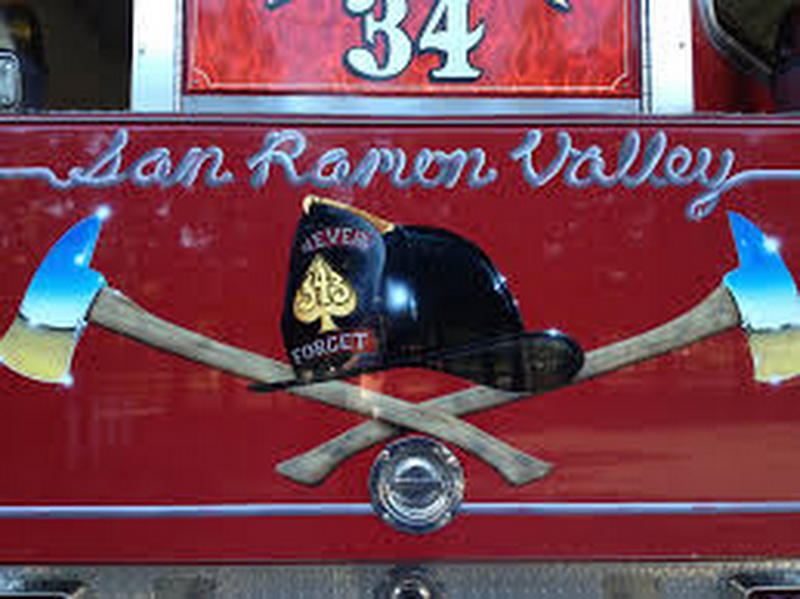 The big “San Ramon Fire District” sign had a button which set off the siren. Fereira said that one day an older woman who was drunk pushed the button. She thought it was a hotel. There are plenty of other stories -- just ask a retired fireman! As the population soared to over 50,000 in 1980, the San Ramon and Danville Fire Districts started talking about a consolidation. That story continues next time.